And I’m back from one of the most beautiful experiences of my life – a two week holiday in Ladakh! I didn’t know what I was getting into signing up for this trip to Leh. I’d been to Leh last year, loved it and yet for some reason had felt the urge to go back there again. The opportunity presented itself in the form of JwM. I knew I needed a break. This was a good 15 days. A long one in a long time! But I was apprehensive. I was going to join a group of 10 unknown people. Looking back I’m glad I took that plunge. What’s stood out for me from the past two weeks is the “quality” of the interactions I’ve had. I say quality because somewhere down the road pointless, banal conversations were beginning to become a fad in my routine mundane life. There had to be more to everyday existence, I would hear myself say not too audibly though. Not every relationship had to be transactional in nature – measure for measure, cautious giving and expectant receiving, like a book of records. But as sad as it may sound, even everyday pleasantries such as a simple, ‘Hi! How have you been?’ were suffering the same fate. And it was what I’d witness rather frequently. I wanted out. And I’m pretty sure I got what I wanted. Along with me were these 10 other soul-searching enthusiasts. The first few days went into conversations around what each one of us was currently doing – studying, working, freelancing, volunteering or even quit jobs to figure out the larger scheme of things. 10 may be a small number, but it was the range of thoughts, ideas and perspectives that was potent. Moving from what each was currently doing to what we want to see ourselves doing only added another dash of colour to these exchanges. We came from different backgrounds – geographically, academically/professionally; our life experiences so far had been unique to us, and us alone. Yet amidst that we resonated with each other. We’d each flirted with a similar set of challenges, posed existential questions to ourselves and a select few around us. We couldn’t stop, nor were we interested in stopping. Why do we do what we do? Why don’t we stop even when we’ve seen and known of the consequences? Where can one start? How can on make that difference? What’s the cure for inertia? Why the need for validation even when the act in itself is self-destructive? As we listened to each voice their dilemmas, concerns and suggest possible ways forward, there was an all pervading sense of reassurance — we weren’t alone. That there were other brave hearts around who’d tread similar un-treaded paths only to discover solutions the mainstream majority with its mighty blinkers on had failed to notice. Our hunger for solutions has only been further nourished, armed with the quest to know more and learn more. And we not only learnt from each other but also about each other… so much so that we realized that none of us were christened in accordance with our characters. So now we’re now a crazy bunch of 10 with aliases! We learnt how one is allergic to elaichi (cardamom), others to chocolate, and that peas makes someone else grumpy! All the while, as a group we weren’t only pushing ourselves intellectually. We pushed ourselves physically as well. To start off with — the dry toilets. ‘Nuff said. Coming in primarily from the cities, much too pampered with our everyday comforts and luxuries (depending on which end of the continuum you are at and consider these as essentials), we learnt the Ladakhi way of making do with available resources in a way in which you minimize (actually eliminate) any form of wastage (in this case water) and conserve better (that being compost). About 10 days of following that regime and now I wince every time I have to use a flush. Or even hear one. Trekking through the dry, arid landscape with the Ladakhi summer sun smiling generously on us, we learnt to be mindful. In fact one just had to be mindful – to focus on nothing but two things: the rhythm of your breath and the rhythm of your steps. Almost Zen-like! Up and down the terrain comprising of loose mud and sand, very little vegetation and even little oxygen lugged with our backpacks, we ascended to around 13000 ft above sea level. 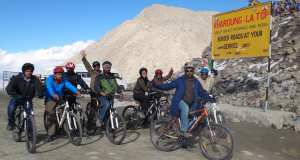 Cycling down 39 kms on the highest motorable road; Khardung-La (18,030 ft above sea level) has had to be the highest of highs (except of course of the 10 km odd bumpy stretch that renders your rear end rather numb for more than a while thereafter)! ‘What is this life if, full of care, We have no time to stand and stare’. Yet another Zen challenge – because no matter how much one would want to admire the snow-capped peaks in the distance or the rays of the setting sun kissing the rims of the mountains, you couldn’t do it whilst zig-zagging down the curves! It meant finding your own pace, sticking to it and enjoying the wind in your hair and the warmth of the sun on your back. We camped outdoors – twice! Under the starry skies. Watching out for a shooting star to wish upon. Bracing ourselves to brave the chilly winds through the night even though we were ensconced in our tents beneath layers of clothing, sleeping bags, and blankets! Adventure was further upped when we rafted 28 exhilarating kms through the Zanskar Valley. We watched as the river waters had incised rocks. A different high altogether nevertheless – ensuring we rowed the oars in sync, grinning and shivering as the rapids struck. O adrenaline rush. Our conversations were never held in silos. Or bereft of the realities of the environment we were in. Walking through Srinagar was a different experience. It was my first time there, though only for a few hours. All that I’ve known about Srinagar was from the stuff that’s in the newspapers and TV. But there was context, history, and a host of circumstances that I’d either forgotten or never known of. I can’t claim to know all of it, but I’m wiser today than I was about 2 weeks ago. Driving to Leh via Kargil was artistic poetry – blue skies, greenery splattered against the mountain ranges and translucent waters. I’d been to Ladakh last year and ‘experienced’ it from behind tinted glasses. This time around, however, the one on one interactions with local Ladakhis across age groups on their experience of being in a region that has been undergoing tremendous shifts within its very way of life was why I (and the 9 others with me) did not feel like tourists over those 10 days. You experience warmth, genuine concern, gracious hospitality, beaming smiles, simplicity and humbleness – this and much much more being served with humility to a bunch of strangers like ourselves. When did anyone of us experience that the last time? And what would you make when, standing in the sacred grove of a 2500 year old juniper tree, your host says in a matter-of-factly manner that there is a reason why your paths have intersected. You are bound to believe him. Speaking to the students at SECMOL was a revelation of sorts as they spoke of their aspirations, of who they wanted to be further exposing the dilemma around fewer wanting to go back to their villages and fields. I’ve heard and read debates being intellectualized on how and what comprises growth, development, and progress within a society; that how the 21st century is paving the path for a world without borders and hence a glocalized society. The wordplay never made it clear to me which end of the debate I stood on (or should stand on). But watch the ‘The Economics of Happiness’ (that I did because of this trip) and read ‘Ancient Futures’(which I’m currently) and you’ll see a different perspective altogether. Just in case you never make it to either (or both), I’d leave you with a thought that I couldn’t find an answer to – what’s the justification behind finding fruits such as bananas and watermelons in abundance or an increasing number of rice dishes being served across Leh when it’s not a local produce? And how much do tourists and natives know about the local produce? What is being done to strengthen the local economy? Or at an even more fundamental level, is anything even being done? What would you make if a local Ladakhi tells you that within their culture, a rich person has enough produce from their farm to last them nine years, whereas someone with less has enough to last them six years…and the poor have enough to help them survive three years! Enough to survive without having to move a muscle. Could you and I with our educational qualifications and ‘jobs’ ever dare to claim to have enough… let alone for how long the duration? So then is what Ladakh’s experiencing unique to it alone? No, other cultures across the globe have had and are currently experiencing these. And there have been disastrous consequences. But what do the locals want? One wise old man who’s travelled the world and quite aware of what this entails put it rather practically saying, ‘Change is constant’ and there’s no reason why a culture shouldn’t be able to reap the benefits of “progress” society makes. At what cost I am tempted to ask? In other words how do you strike the ‘right’ balance – should there be any such thing? A nameless co-passenger, a silver haired resident from London, on my flight out of Leh found me reading ‘Ancient Futures’ and had also watched ‘Economics of Happiness’ was able to provide me with a justifiable line of thought. According to her, while some cultures across the world were caught unawares by these changes, Ladakhis have the advantage of opting in (or out) with their eyes open. That there is such a thing known as namkeen chai (butter tea) and it is an acquired taste. So this conversation with this nameless lady struck a chord within me. It was almost like a beautiful way to add continuance to my Ladakh trip that began with a bunch of strangers sharing experiences that somehow found resonance with each one. So my nameless acquaintance while speaking of her time in Ladakh spoke of the warmth the locals exuded, no matter what the time or the task at hand and greeted everybody smilingly with a ‘Julley’. She recalled to mind of the time her mother had taught her as a kid to wish and greet people in the street with a ‘Hello’ and a ‘Good Day’ and which in present day context has somehow gotten eroded in the urban hubs with its growing lack of trust and sense of insecurity. That statement made me reflect for a moment because it is quite true everywhere I look – let alone greet another person, people seldom seem to smile anymore!